Drinking coffee is truly one of life’s great joys, and more goes into creating that pleasurable experience than meets the eye. When we serve a cup of coffee at Highland Coffees, we are completing a long and complex process involving the work of countless people. Great care must be shown by coffee farmers, processors, and exporters in the producing countries, by importers and shippers in our country, and finally by the roaster and baristas at Highland Coffees to bring coffee through its long journey from seed to cup. We are connected through coffee to people and cultures in lands far away, all devoted to producing this product that we love. Coffee is a remarkable beverage. Not only does it fill our senses with wonderful aroma and flavor, but it also helps us start the day more enthusiastically, focus on work more clearly, contemplate great books more deeply, and converse with friends more attentively. 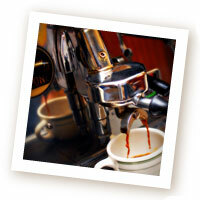 At Highland Coffees, we are passionate about finding and roasting coffees that are among the best in the world. Our coffees are imported from farms located throughout the historic coffee growing regions of East Africa, Indonesia and its surroundings, and Central and South America. We are pleased to bring this magical product to our customers, by the pound or by the cup, and committed to trying to make their lives a little better every day through our efforts.